Examples: ‘Abdullah Azzam’s tours in Europe and the US at a variety of Mosques, publication of Join the Caravan and al-Jihad Magazine, and a variety of old school VHS-type videos that came out of Afghanistan, Bosnia, and Chechnya. Examples: al-Hesbah, al-‘Ikhlas, al-Fallujah, Ansar, and Shamukh. Since last Thursday, when a powerful remotely-detonated bomb tore through the popular Argana café in Marrakesh’s Djemaa al-Fna, analysts and Moroccan and French government officials have been trying to figure out who was responsible for the attack, a surprising one given Morocco’s relatively quiet security situation since the 2003 Casablanca bombings, which saw coordinated attacks against Jewish and other targets in the city killing 45 people, including 12 suicide bombers. The bombing, which tore through the café and left a gaping hole in its façade, bears many hallmarks of an al-Qaeda-style attack; the Djemaa al-Fna is one of the most popular tourist sites in Morocco, and the Argana is situated at the heart of the square, commanding views over the activity below. The tourist draw of the restaurant is reflected in the high toll foreigners paid in the attack; of the 16 people killed, the victims included eight French citizens (including a 10-year old girl), a Briton, and two Swiss residents. Two Dutch tourists identified have reportedly provided a sketch of the suspected bomb-placer to Moroccan authorities. Moroccan government officials, including government spokesman Khalid Naciri and interior minister Taeb Cherkaoui, have both also said that the attack could be the work of al-Qaeda, pointing not only to the kind of bombing but also the professional construction of the device and the explosives used, which included the volatile compounds TATP and PETN. Either or both explosives have been used in multiple serious attacks and plots, including Richard Reid’s attempt to bring down a transatlantic flight with a shoe bomb in 2002, the 7/7 London transportation bombings, Omar Farouk Abdulmutallab’s attempt to down Northwest Flight 253 with an underwear bomb, and Najibullah Zazi’s plot to attack the NY Subway system.The construction of such an explosive is a complicated process, one that likely required some manner of resources and personnel support, as well as a skilled bomb-maker. However, this evidence is insufficient to assume an al-Qaeda attack (at least without further information), and I think it highly unlikely that this is the work of the group’s North African affiliate, Al Qaeda in the Islamic Maghreb (AQIM). French interior minister Claude Guéant prevaricated on this point when asked by a French journalist, saying that he would wait until a formal claim is made to say whether or not AQIM, which is currently holding four Frenchmen hostage and has consistently threatened to attack France and French targets in the Maghreb, is responsible. While active in Algeria and several Sahelian countries, AQIM has never shown any particular interest in Morocco. While the group has recruited some Moroccans, it has generally failed to integrate members of the defunct Moroccan Islamic Combatant Group (GICM) and has only referenced Morocco a handful of times over the course of its existence (the last Morocco-focused AQIM statement I know of was released in June 2008, though a January 2011 statement from AQIM leader Abu Musab Abdel Wadud said, “By Allah…we haven’t forgotten about our prisoners in Morocco, Tunisia, Mauritania, Algeria and others”). Additionally, the AFP reports today that a crudely-edited video posted on YouTube last Monday purporting to be from “The Moroccans of Al Qaeda in the Islamic Maghreb” threatening attacks against the Moroccan government was in reality taken from a 2007 AQIM tape, and was posted straight to YouTube, rather than being posted to jihadist forums, the group’s standard practice. I believe it is more likely that the attack was carried out by unaffiliated or loosely-affiliated Moroccan jihadis, who may have received training abroad, whether in Iraq or along the Afghanistan-Pakistan border. 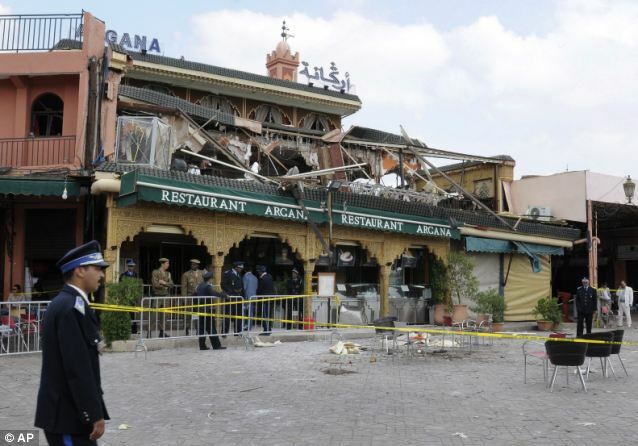 Moroccans unaffiliated with al-Qaeda have participated in several major attacks over the years (the 2003 Casablanca bombings, the 2004 Madrid bombings, and aborted attacks in Casablanca in 2007). While it is entirely possible that the use of PETN and TATP indicate al-Qaeda influence, they are not the only group to make use of these materials, and non-al-Qaeda jihadis could have picked up their bomb-making skills and experience in camps without actually being members of or taking direction from al-Qaeda. It is also worth noting that this attack comes at a particularly bad time for Moroccan jihadis. Morocco’s King Mohammed two weeks ago released a number of Moroccan salafi-jihadis from prison, including one-time pro-jihadi imam Mohammed Fazizi. This attack will almost certainly lead to a crackdown on both violent and non-violent salafis, and the group Salafiyya Jihadiyya was quick to issue a denial of its involvement in the attack. Interestingly, participants on both Arabophone and Francophone jihadi forums have been nearly unanimous in their suspicion of the attacks, with nearly all commenters accusing the Moroccan government of committing the attacks in order to have an excuse to arrest jihadis and warning each other not to take trips to Morocco in order to avoid being swept up by the country’s police. Given both the poor timing and al-Qaeda’s longtime non-interest in Morocco, it seems likely that the attack was carried out by an independent jihadist group operating on the fringes of the jihadist scene in Morocco. We will not know for sure until someone claims responsibility for the attack, but even that will not necessarily settle things — after all, a group like AQIM may claim responsibility opportunistically, and unless an eventual claim comes with direct evidence of involvement (say, for instance, video of the bomb being constructed or footage of the bombing as it happened) I will remain skeptical. Needless to say, the circumstances surrounding the bombing are murky, and will likely remain so for some time.